CDM Regulations 2015 - A summary of the changes relating to domestic works (Health and safety). The previous 2007 CDM Regulations are being replaced to make it ‘easier’ for everyone involved to understand what they need to do the job safely. Small- and medium-sized construction businesses will have to make a plan and manage Health & Safety when the Construction (Design & Management) Regulations 2015 come into force on the 6th April 2015. This means that for the first time, any construction work whether it is a new bathroom fit out or an extension will need a Construction Phase Plan. 1. The revised Legislation applies to all projects including for the first time Domestic Jobs. 2. All projects must have a written Construction Phase Plan. 3. The role of CDM Coordinator in the previous CDM Regulations 2007 has been removed and replaced with a new role of Principal Designer. 4. There is a duty to make sure all persons doing the job have the right skills, knowledge, training and experience. 5. Some domestic and non-domestic projects will have to be notified to the Health & Safety Executive by the client, or for and on behalf of the client. HSE documents ‘Draft Guidance on the Construction (Design & Management) Regulations 2015’ which can be found on the Health & Safety Executive website. This publication provides Draft Legal Series Guidance on the legal requirements in the CDM Regulations 2015. The Regulations came into force on the 6th April 2015 to help anyone who has duties under the Regulations to prepare in advance. 1. For all projects including for the first time ‘domestic job’ including a new bathroom fit out or an extension. 3. CDM Coordinator is replaced by ‘Principal Designer’. 4. All persons doing the job to have the right ‘skills, knowledge, training and experience’. 5. Some domestic projects will have to be notified to the HSE by the client. b. A contractor as Principal Contractor. 7. If a client fails to appoint a Principal Designer the client must fill the duties of the Principal Designer in Regulations 11 and 12. 8. If the client fails to appoint a Principal Contractor, the client must fulfil the duties of the Principal Contractor in Regulations 12-14. 9. 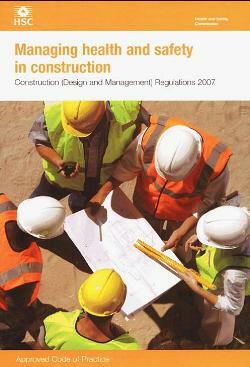 A Health & Safety file is only required for projects involving more than one contractor. The client must ensure that the Principal Designer prepares a Health & Safety file for their project. Its purpose to ensure that at the end of the project, the client has information about Health & Safety risks that anyone carrying out subsequent construction work on the building will need to know about. The Principal Designer to review and revise the Health & Safety file at sufficient regular intervals and pass the completed file back to the client/building owner at the end of the project. b. Exceed 500 person days. 14. The completed Form F10 to be displayed on site, as required previously. 15. REMEMBER – THE REQUIREMENTS OF THE CONSTRUCTION (DESIGN & MANAGEMENT) REGULATIONS 2015 APPLY TO WHETHER OR NOT THE PROJECT IS NOTIFIABLE. I do hope the above summary will be of some benefit and would strongly recommend further reading on the matter in order to ensure that we ALL work together in order to comply with the new Statutory Requirements of CDM 2015. On the projects where Christopher Hunt is ‘Principal Designer’, I will continue in the same manner to take responsibility for and on behalf of the client for the preparation of the Pre-construction Information Package, following which the Principal Contractor will be responsible for developing the normal Pre-construction Risk Assessments, Method Statements and forwarding to the Principal Designer in the normal manner prior to works commencing on site. The responsibility for assessing whether or not the project is notifiable to the HSE will rest with The client who will complete the F10 Notification if required, and copy to the Principal Contractor for inclusion in the Principal Contractor’s Health & Safety file and for displaying on site, in the same manner as under CDM Regulations 2007.